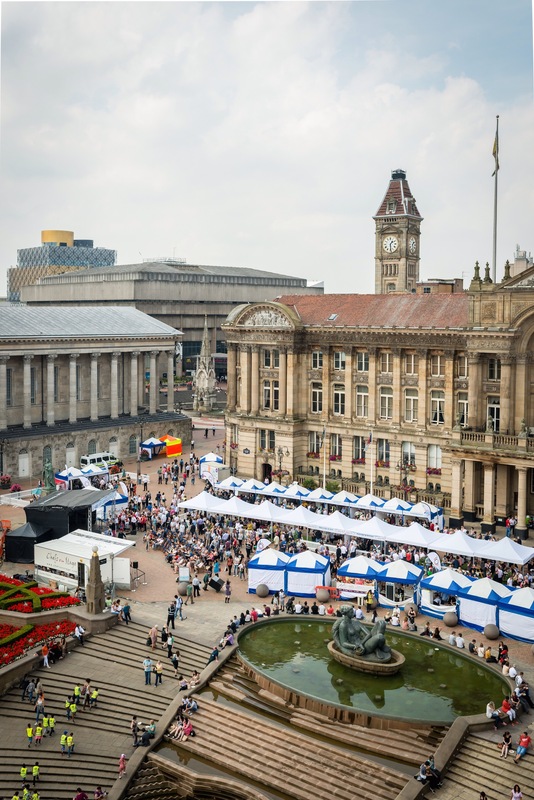 Colmore Food Festival: Friday 3rd July and Saturday 4th July. Birmingham City Centre. 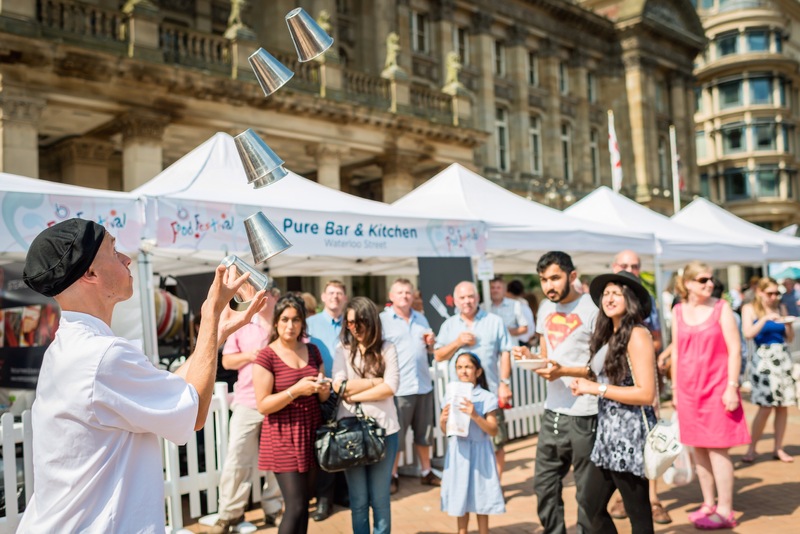 The fifth annual Colmore Food Festival is back in July and will showcase the superb food and drink offering in Birmingham’s business quarter, Colmore Business District (CBD). 25 venues, the majority of which are independent businesses, will be serving taster options priced at just £3 in Birmingham’s Victoria Square on Friday 3rd July and Saturday 4th July 11am-19.00 and is free of charge. This year sees three new independent CBD venues taking part in the festival, as well as the return of some of the district’s finest eating and drinking establishments, where visitors can sample an array of mouth-watering internationally inspired cuisines as well as traditional British options including many Vegetarian choices. 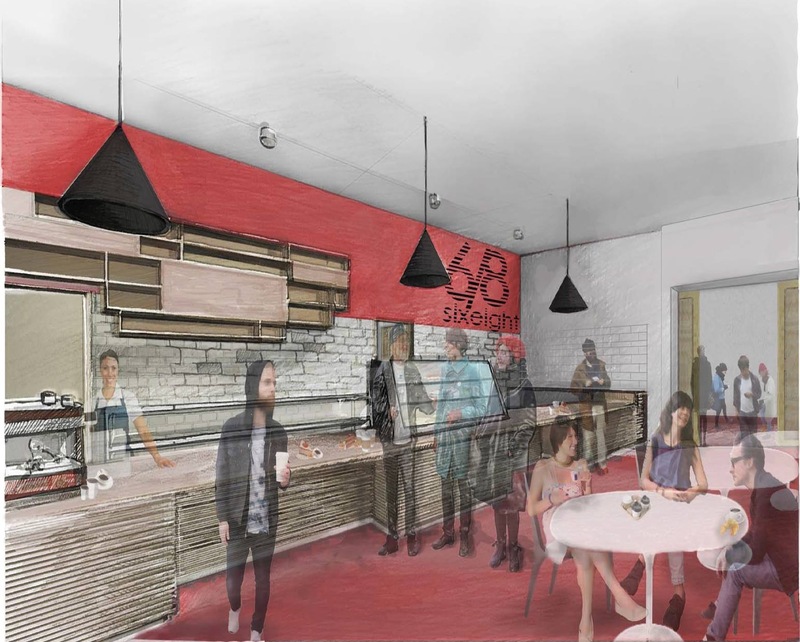 Alongside the varied food offering will be artisan coffees, real ales, champagne and delicious cocktails. There will be a programme of live cooking demonstrations from top chefs in the District, as well as live jazz music, outdoor theatre, and other entertainment during the festival’s two day run. All Bar One, Ashas, Bar Opus, Chung Ying Central, Costa Coffee, Edmunds Bar, Edwardian Tea Rooms, Hindley’s Bakery, Hotel Du Vin, JoJolapa, Metro Bar and Grill, Old Joint Stock, Opus at Cornwall Street, Pure Bar and Kitchen, Purnell’s, Purnell’s Bisro and Ginger’s Bar, Refreshments by Centenary Lounge, The Bureau, The Old Contemptibles, The Square Peg, The Wellington Real ale, Urban Coffee Company, Nosh and Quaff, Yorks Bakery Cafe. The Colmore Food Festival is always one of my favourite festivals of the year, it’s good fun and with good vegetarian food options on offer, plus a lively atmosphere it is a good family day out. Look out for further updates on Veggie Foodie as I have them plus more details on the vegetarian food options. Keep fingers crossed for a weekend of sunshine. Note the first two pictures are courtesy of Clive Reeves PR team who brought the event to my attention. 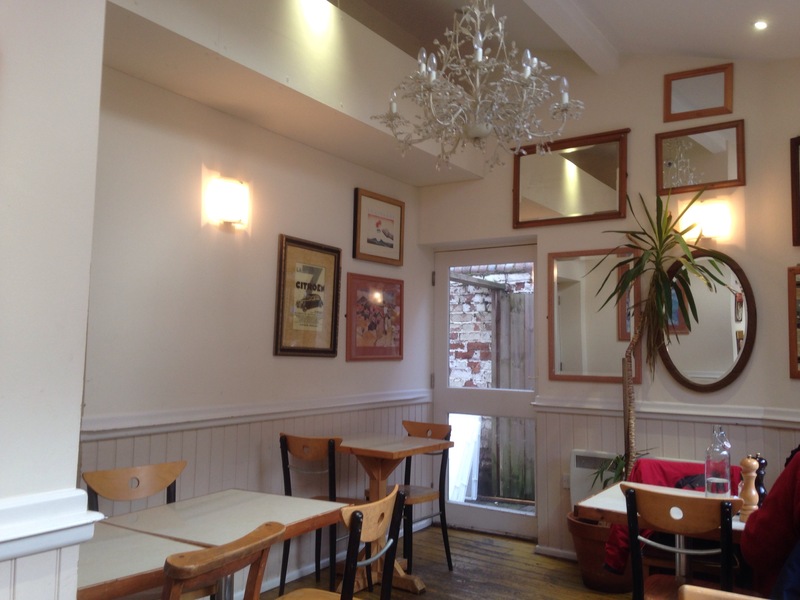 Maison Mayci in Kings Heath is the relaxed, informal and quaint cafe that the French do so well. Here in the south of Birmingham Ruth and I have enjoyed a fair few cakes, coffees and lunches at this fine neighbourhood find. Located on Poplar Road just off the High Street, it’s a lovely space that offers food rewards in abundance the more you explore the menu. It’s continental in its approach providing patisserie, rustic fresh breads, pastries, and coffee and cake to suit all tastes and appetites. It caters from brunch through to afternoon, lunches are varied, and delicious with anything from homemade soup, sandwiches, mixed platters, veggie and non, pasta specials and quiches. It has good veggie options and the mixed veggie platter and quiches are excellent. Sandwiches are made using their mighty fine freshly made bread and all cakes and pastries are freshly made and well worth a taste. If you want to immerse yourself in a french flavoured atmosphere and a stylish neighbourhood environment then Maison Mayci is for you. Whether with friends or solo, it’s your call. It’s also good for families meet ups, or just with a small child as their is a small play area and toys and the menu is child friendly. 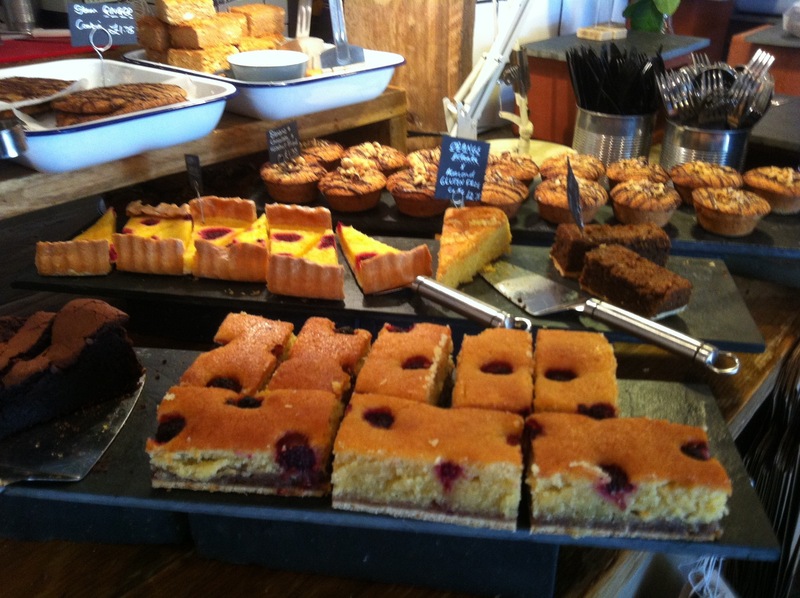 Last week I decided to wander in being local for a coffee and cake. It’s. Good spot to read and to work so knowing that it would be quieter in the afternoon after lunch decided to waste no time and double up with a review. 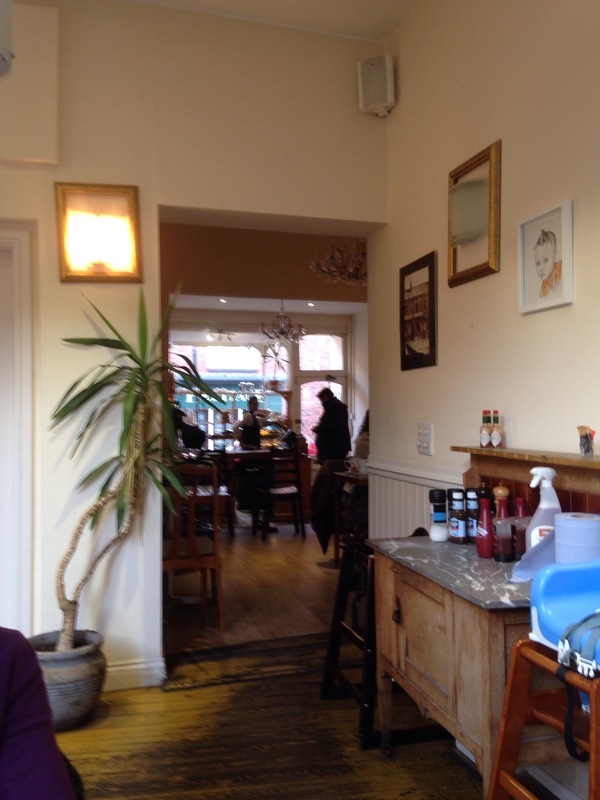 The cafe in Kings Heath is big on atmosphere. 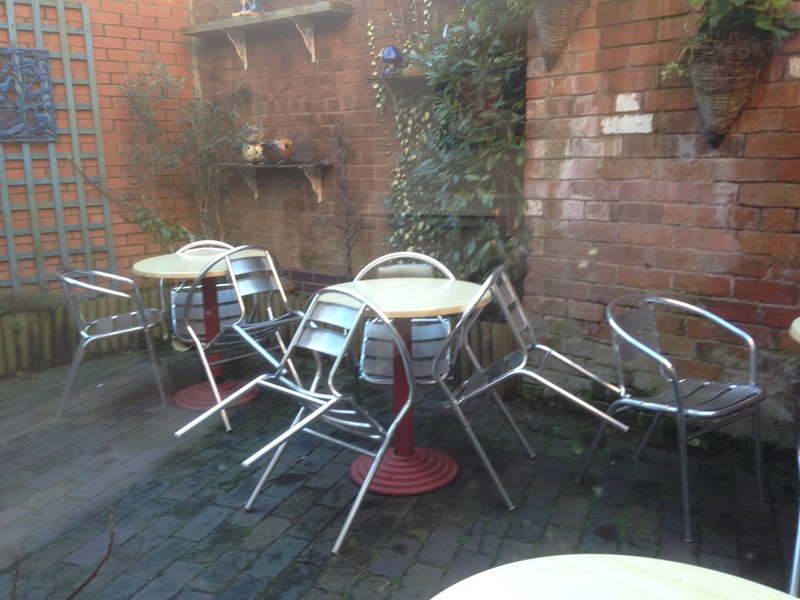 It’s rustic, and has a soft warm charm with its wooden tables and chairs and tempting (well in good weather) outdoor courtyard. The subtle gentle lighting lends itself to calm and the soft chatter of customers is non intrusive though often busy and popular. 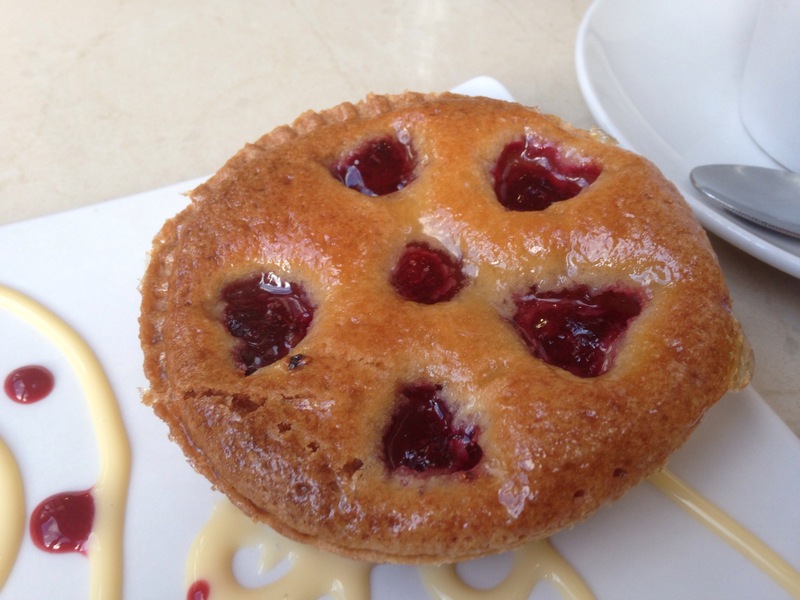 On the day of my visit I ordered a cappuccino and cherry and almond tart. 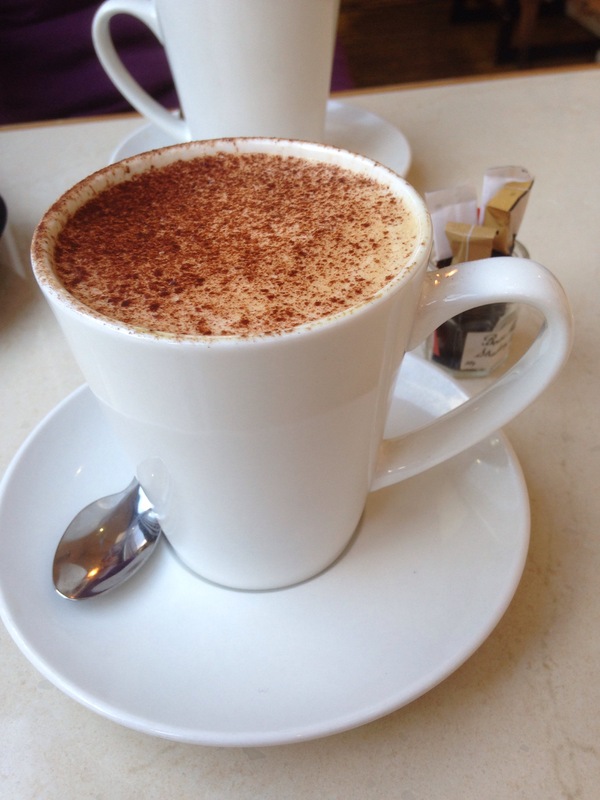 The cappuccino was well made, creamy, with a good coffee balance. A lovely warming drink. 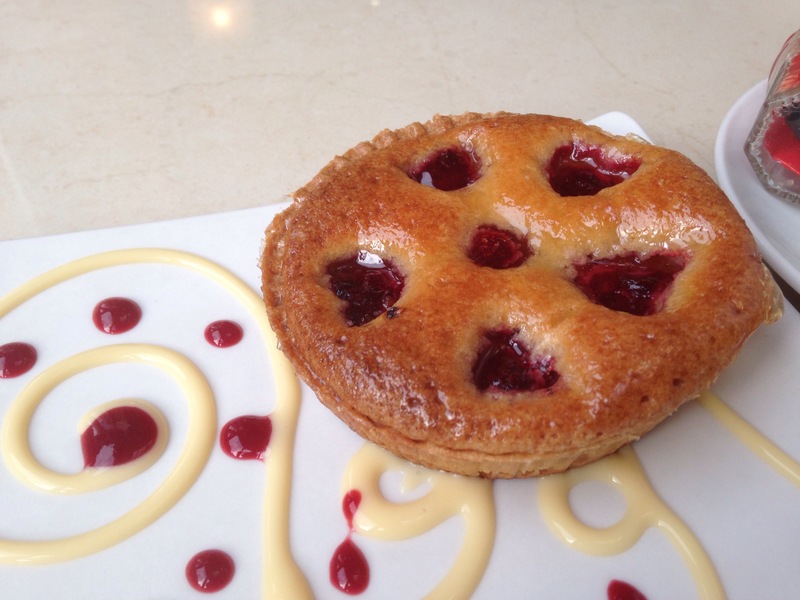 The Cherry and Almond Tart was very well presented, and had was deliciously flavoured with the almond subtle and the pastry firm but not overworked. A fine tart. Both together formed a delightful package and with my book the ideal way to spend time on a cold winters afternoon. All bakes can be taken home and also pre ordered. The tarts and cakes are great when entertaining guests at home and the bread is yummy for brunch on a Sunday at home. Ruth and I are big fans of the bread at Maison Mayci and buy it regularly. 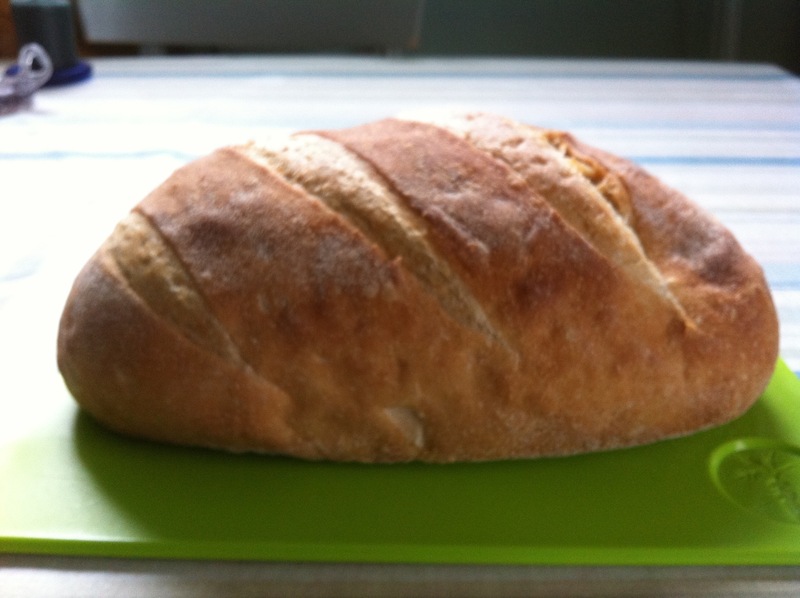 The sourdough in particular is beautiful. 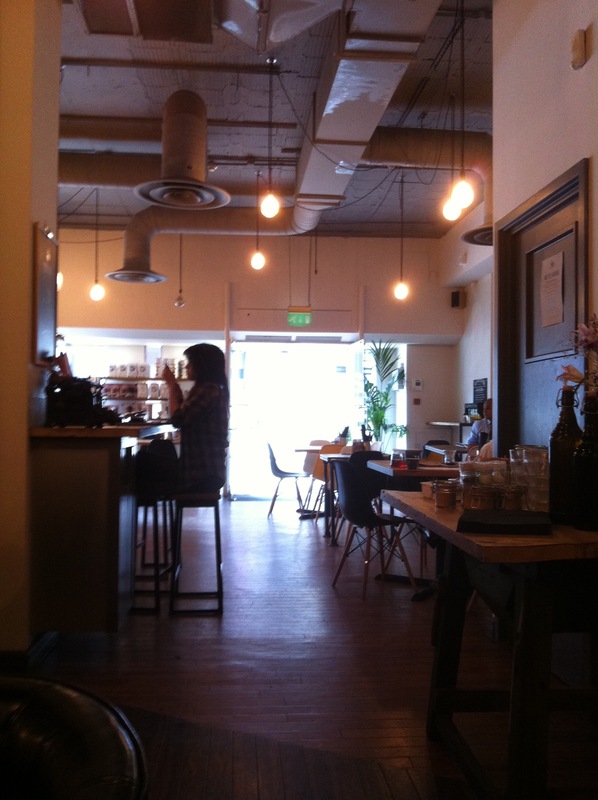 What made Maison Mayci a lovely coffee time spot though is the charming service and friendly charm of a cafe that is right on the money for local neighbourhood friendliness and top food options. It ticked many boxes. You can see why it’s popular, it has a touch of France in South Birmingham an escape from the hustle and bustle outside and the coffee is tres Bon. A place to return to again and again. 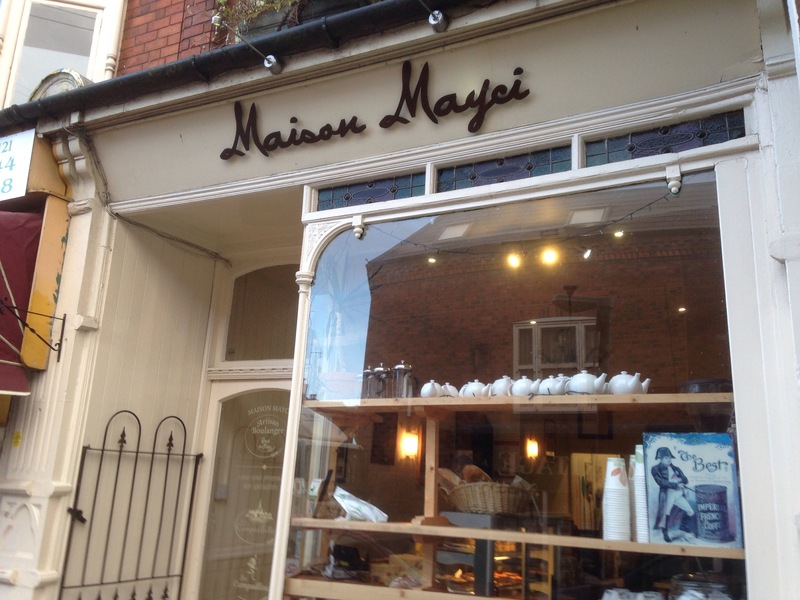 Maison Mayci also have a cafe in Moseley village which serves afternoon tea also. 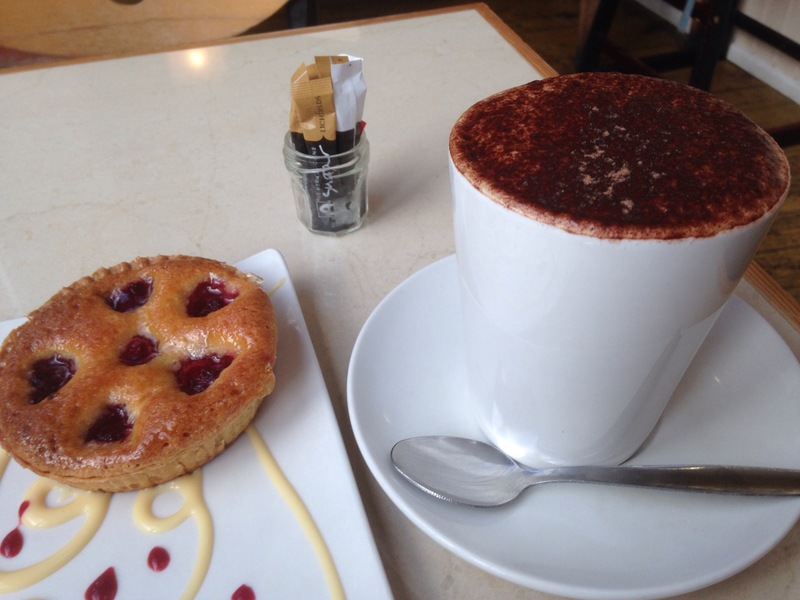 I purchased my own coffee and cake and all opinions expressed are my own and honest. 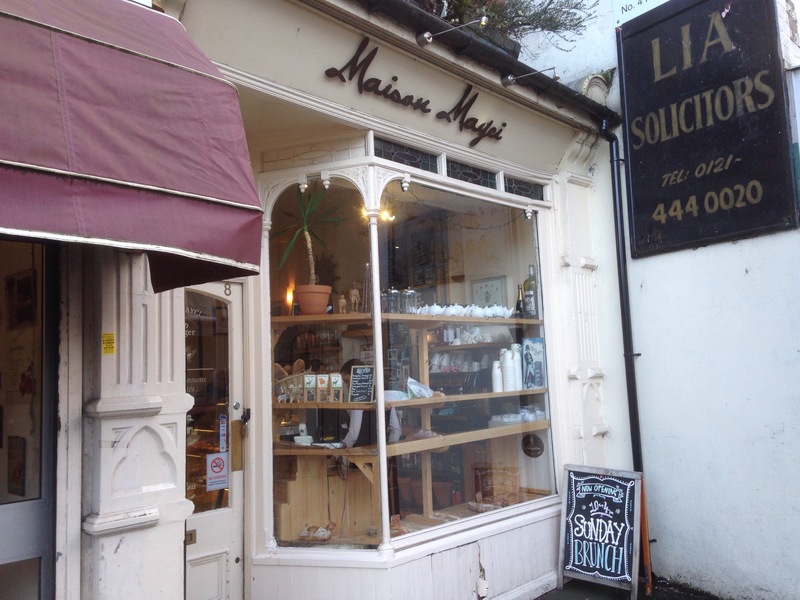 Have you been to Maison Mayci in Kings Heath or Moseley? What did you think? I’ve watched the new Yorks Espresso Bar on the corner of the Great Western Arcade and Colmore Row (opposite Snow Hill Station) progress from an empty building to what can now be described as the most unique and trendily urban hangout selling delicious coffee in a city full of great independent coffee shops. I visited last week, its first week of business to try it out and was rewarded with a brilliant and rewarding coffee experience. 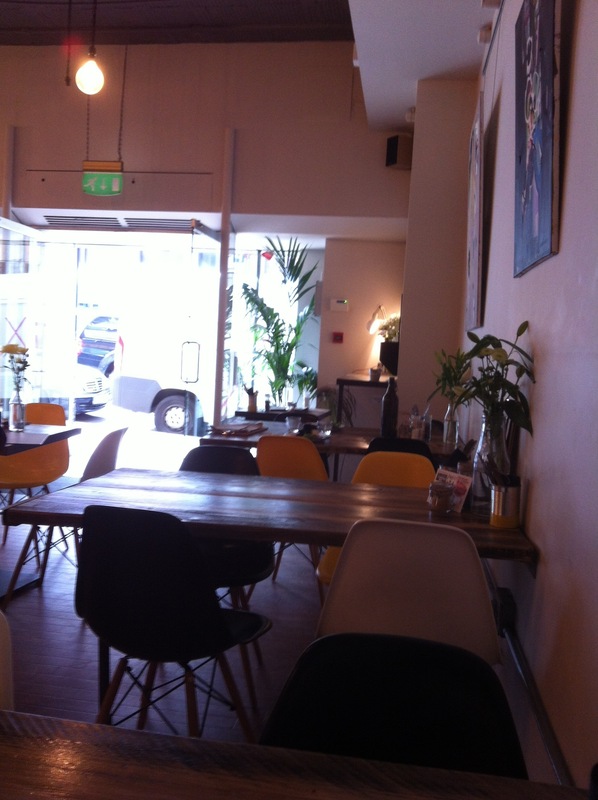 Yorks Espresso bar, little brother of Yorks Bakery on Newhall Street 10 minutes up the road sells great coffee. It’s different. I has a vibe that’s feels very welcoming, knowledgable, and passionate about coffee and its whole experience. It’s modern and cool. 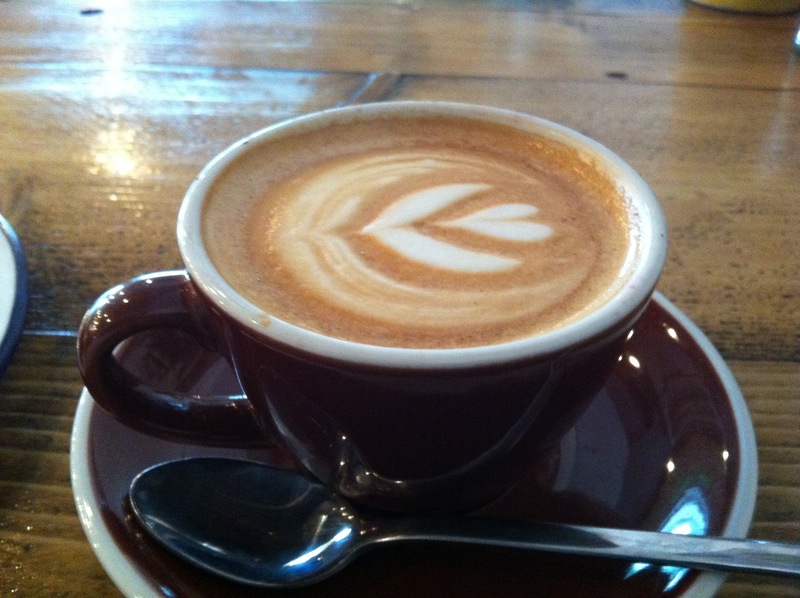 I also enjoyed a delicious Yorks Flat White, and single espresso. Both beautiful. The flat white like at Yorks Bakery is superb, creamy, with a touch of class, maybe the best in Birmingham City Centre. 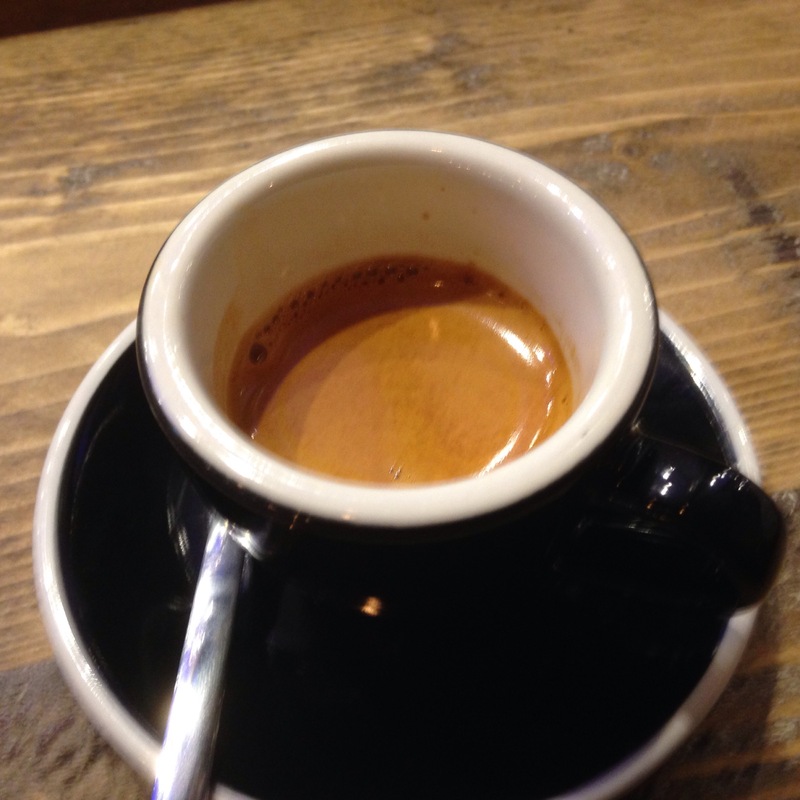 The espresso packed a punch and was excellent too. 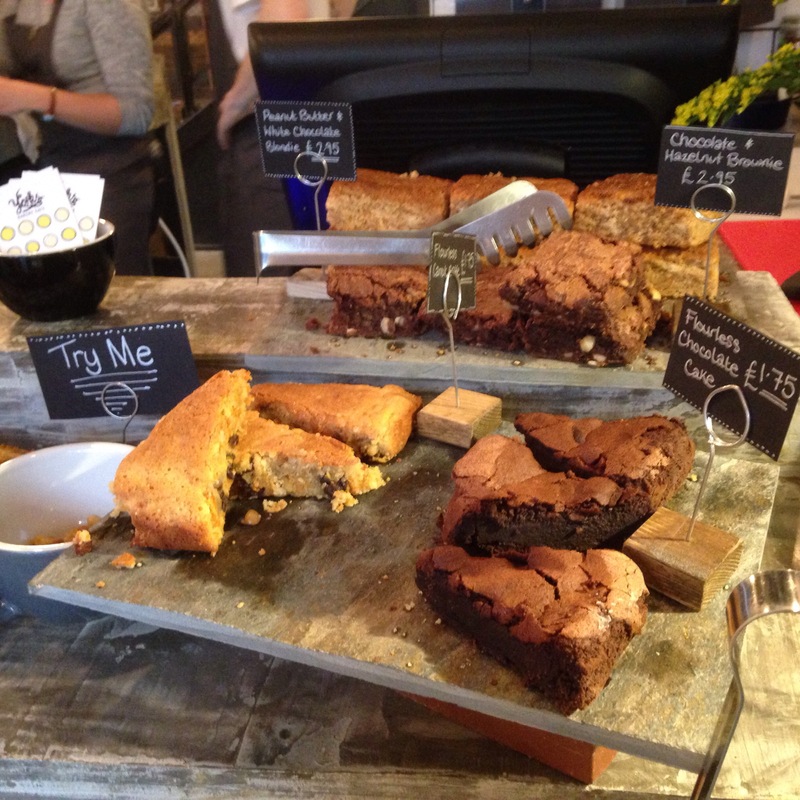 Yorks Espresso bar also serve the trademark Yorks cakes, sandwiches, pastries and muffins. 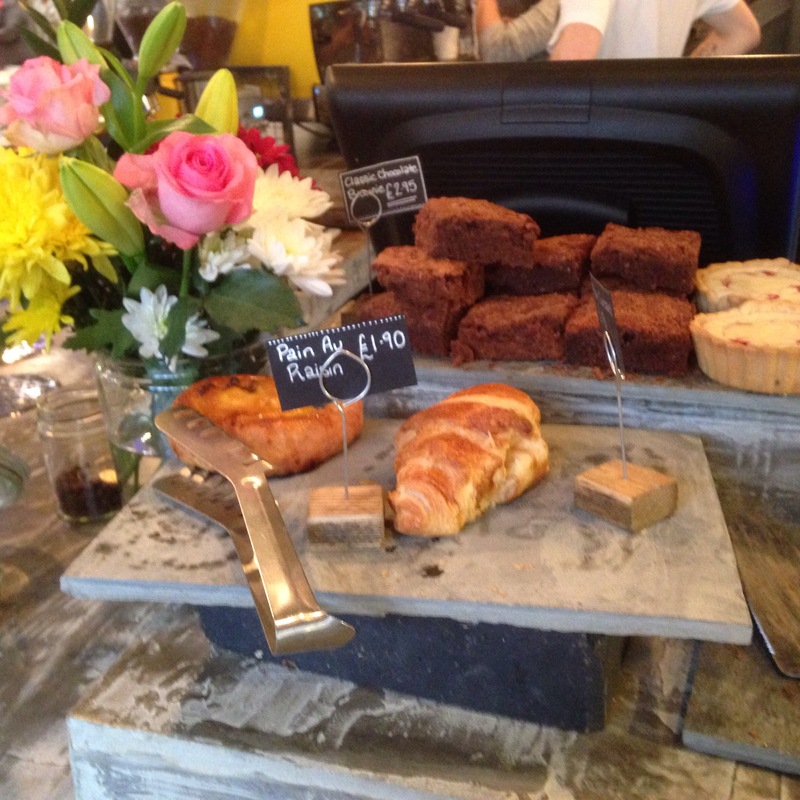 The cakes are lovely if like at Yorks bakery, though I didn’t eat on this occasion. The decor has a comfortable mezzanine section upstairs and downstairs where I sat bar stools to watch the passers by from. Being nosy that’s where I sat watching the rain ease. 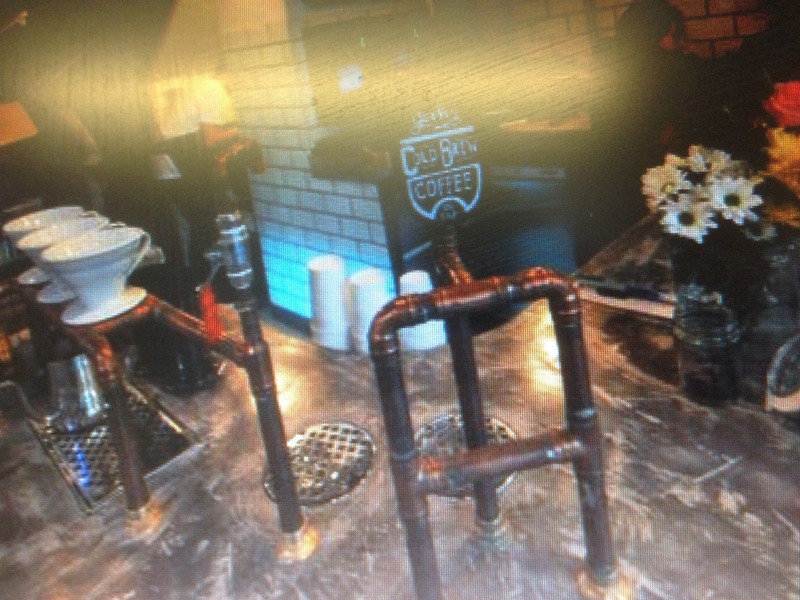 The bar is rustic, and has a long wooden bar with tiled wall areas and menus written on glass on the walls. Very hip, very Yorks. 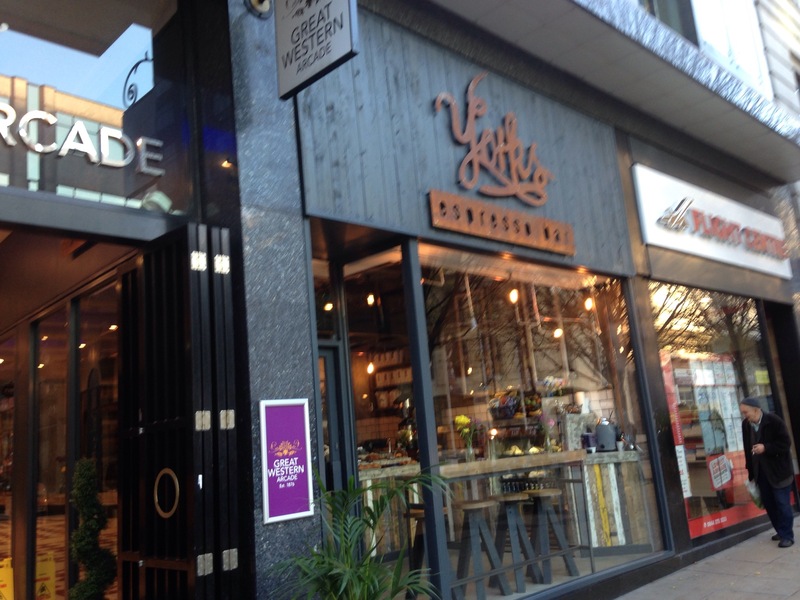 Has anyone been to Yorks espresso bar? What did you think? 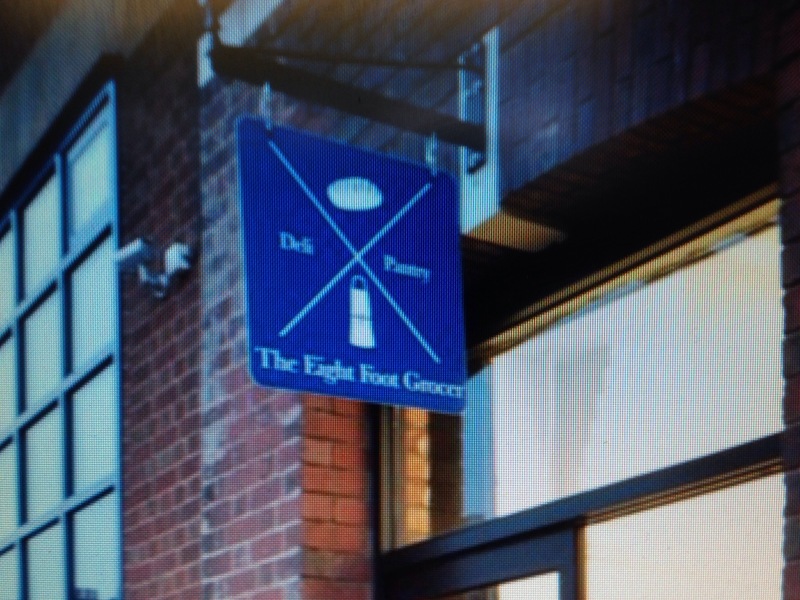 Tall Poppy Foods are a small family based food company based in the Selly Oak area of Birminghamthat specialises in delicious 100% Vegan Foods. 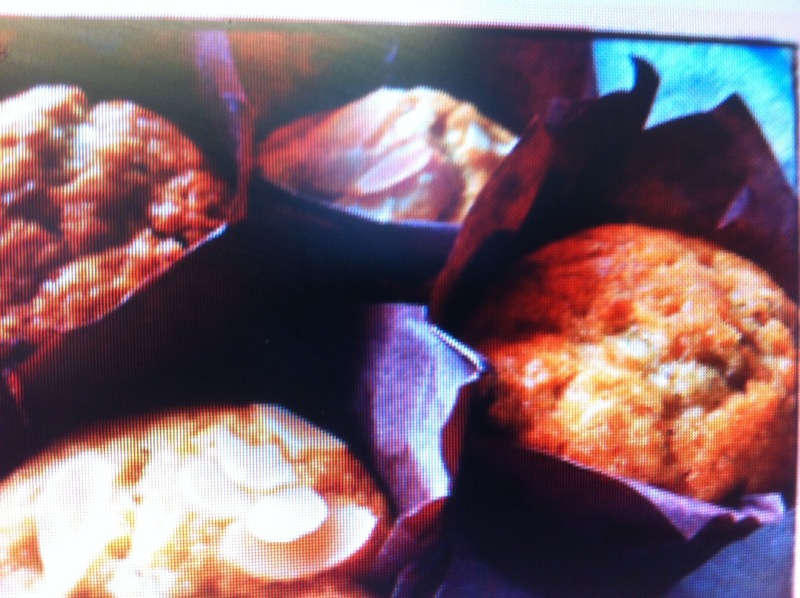 Tall Poppy Foods have been running since October 2012 selling cupcakes online and catering for events. such as weddings, with wedding cakes. They can also be seen at farmers markets. Their mission is to break the stereotype that Vegan and Vegetarian food together can put a bad taste in people’s mouths, and believe that good tasting food should be available to everyone whatever their dietry requirements. Tall Poppy Foods cakes are dairy, egg, honey, lactose, and animal by product free and are lovely. They are 100% suitable for vegetarians and vegans and their ingredients are ethically sourced. 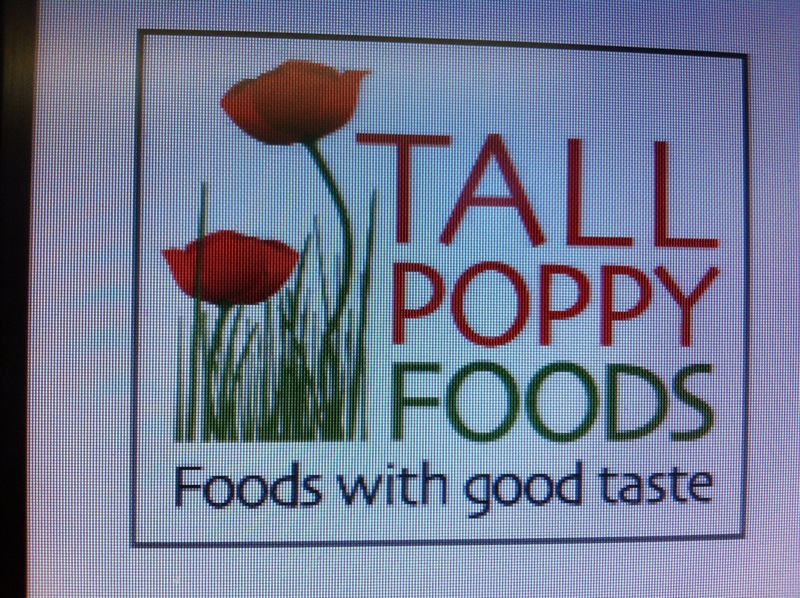 Tall Poppy foods use organic flour from renowned millers Shipton Mill. 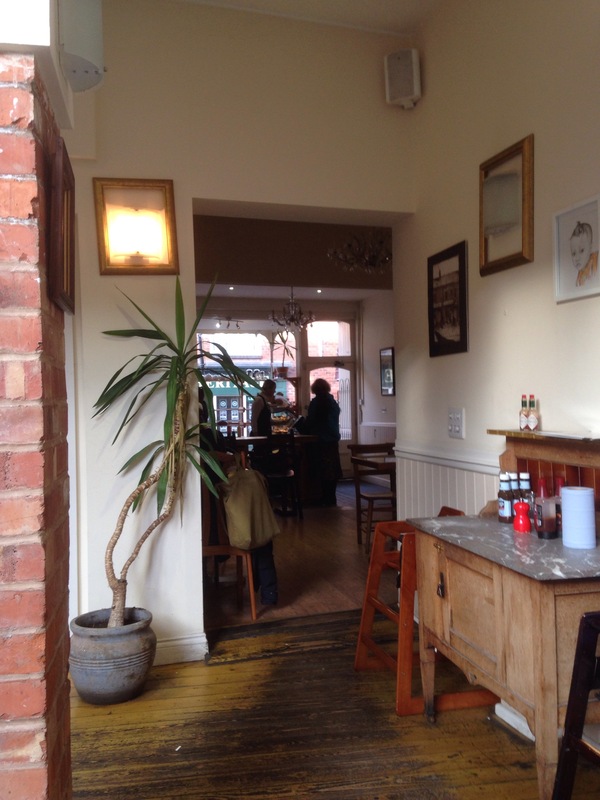 I have enjoyed their cup cakes at Veg Out Cafe in Kings Heath, they taste beautiful. 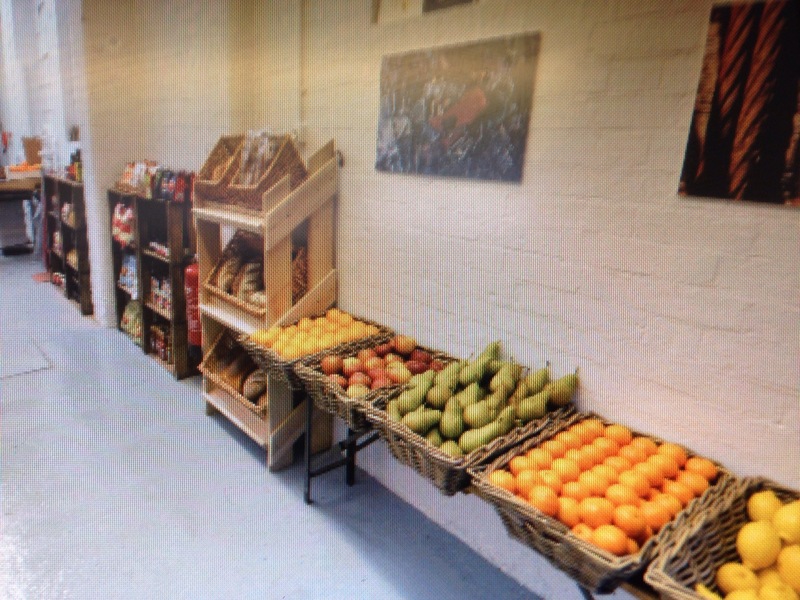 Tall Poppy foods provide foods and cakes for all occasions and deliver 15-20 miles from Birmingham. They can deliver further if they have advanced notice. Their website has full details of their products. Tall Poppy Foods also sell gourmet coffee, wraps and sandwiches, and real fruit smoothies. They are a real vegetarian/vegan food hero. 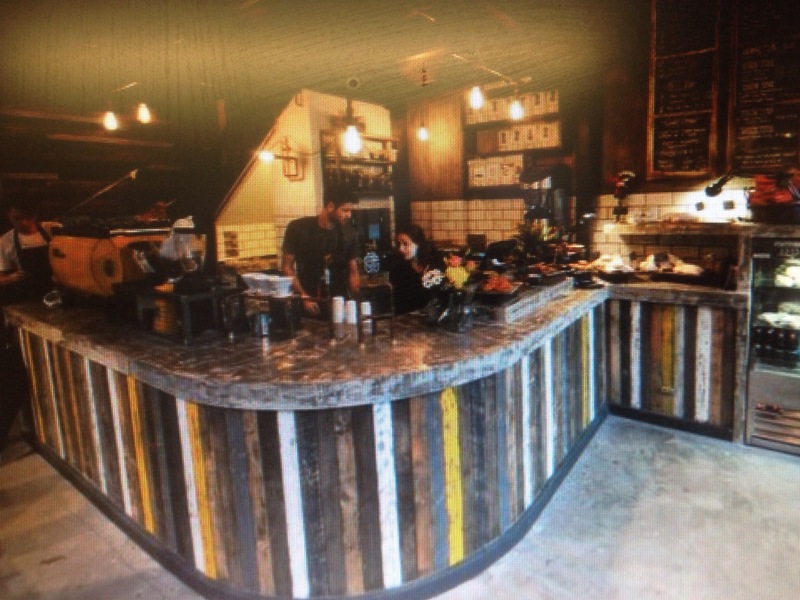 Over recent years there has been a much needed influxof Independent coffee shops and cafe’s opening and thriving in Birmingham. The ammount of money and artistic superlatives that these bring to the City Centre and Birmingham suburbs is no doubt huge. In essence Independents thrive on prividing great coffee and food combinations, taking the process seriously and always striving for that artistic difference that makes them popular and unique. They all offer something different. Whether that be majoring on great coffee, events they put on, or the food that they provide. Often made on the premises. The one thing they all have is a sense of community and a spirit that has been developed out of research and their craft. That is what makes them interesting and gives them the foodie factor. Personally, I’ve always loved cofee shops. They’ve always been a space to go to over and over. To relax in before and after work, a destressor, to read in, to write my poetry and now my blog in, to meet friends and family in and to make friends in. 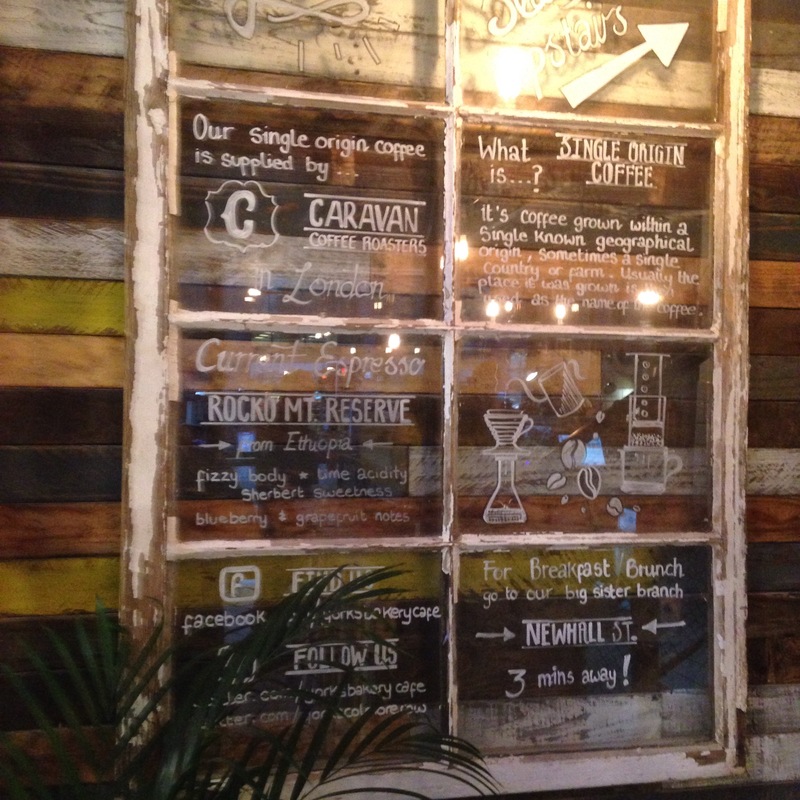 developing coffee scene in Birmingham (and sometimes beyond). 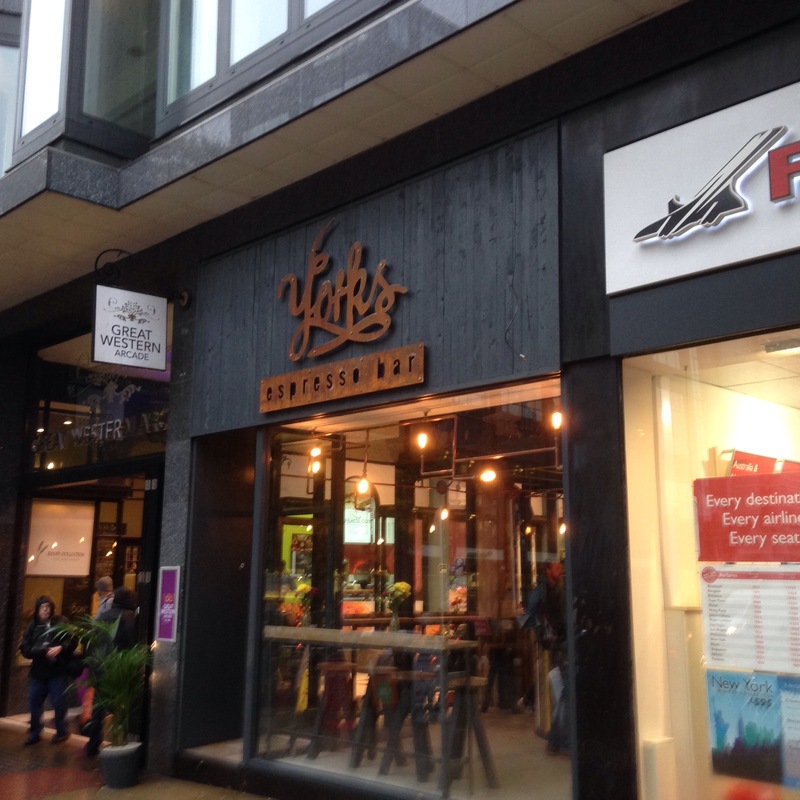 York’s Bakery and Cafe is on Newhall Street (on the corner) in the City Centre off Colmore Row in what is known as The Colmore Business District or Financial district. I visited on a busy Friday lunchtime. I’ve always had a soft spot for York’s, but hadn’t been for awhile due to the huge coffee shop options available in the City Centre. I’ve often visited and wrote my poetry, chatted with friends and visited with my wife Ruth for food on a weeekend. On the day I visited it was busy. A bustling sound and atmosphere. AI notice a good mix of customers, from those who were at work, to families with small children and buggies, from students to people who had obviously were trying York’s Bakery and Cafe out for the first time. York’s believe in an honest approach to its ethos. Inside you are greeted with cool artwork, which is rotating in that they invite local artists to display their work every three months. You also have sturdy wooden furniture which looks like it belongs and zonal seating which make the room seem uncluttered and offers plenty of space depending on your requirements. I like that aspect. Their are two rooms, one at the back is hidden and offers a more private space for meetings and for the studious and groups of friends. 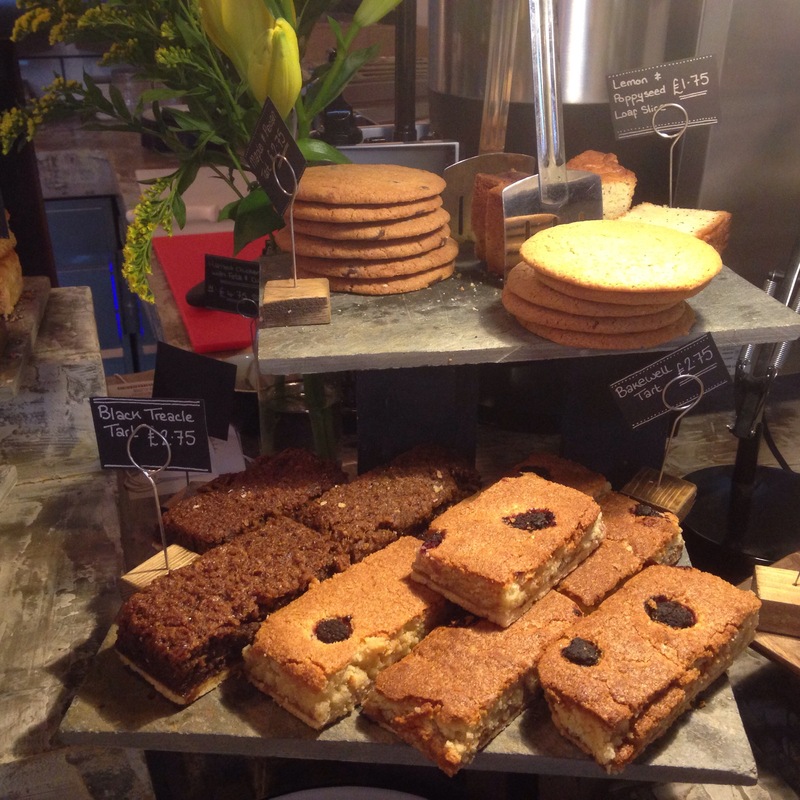 At the counter you are greeted with mountains of cakes stacked high, all very inviting. 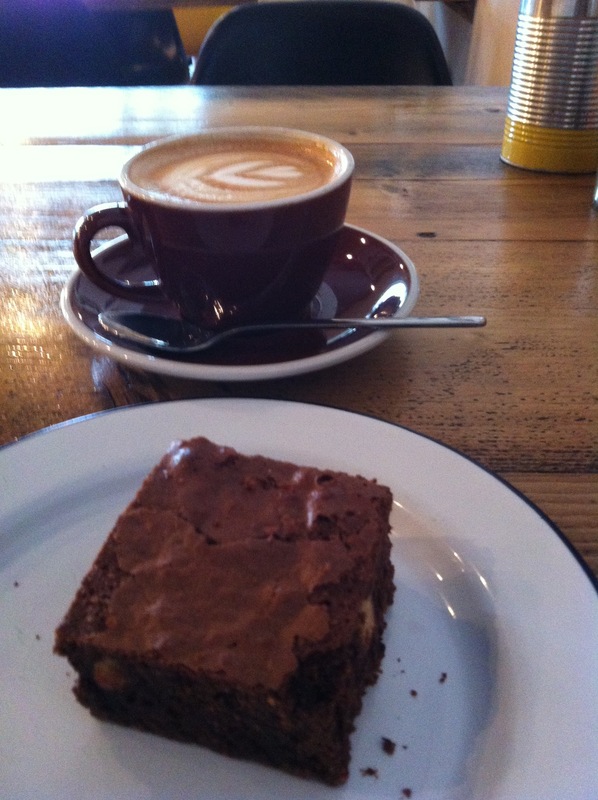 I chose a beautiful chocolate brownie, my test cake, it was beautiful, firm, rich, but soft, with the right balance of chocolate and cake, which slid down well with a perfect Flat white, which was smooth and had the right texture and flavour punch of coffee. A work of art in fact in it’s pretty design on top. The urban feel of York’s works well. The service was friendly, knowledgable, and helpful and they even wiped and cleaned the tables. They were attentive. The music is funky too in the shop, plenty of chilled tunes, a bonus. They have a good selection of teas as well and obviously give them the same billing as the coffee. 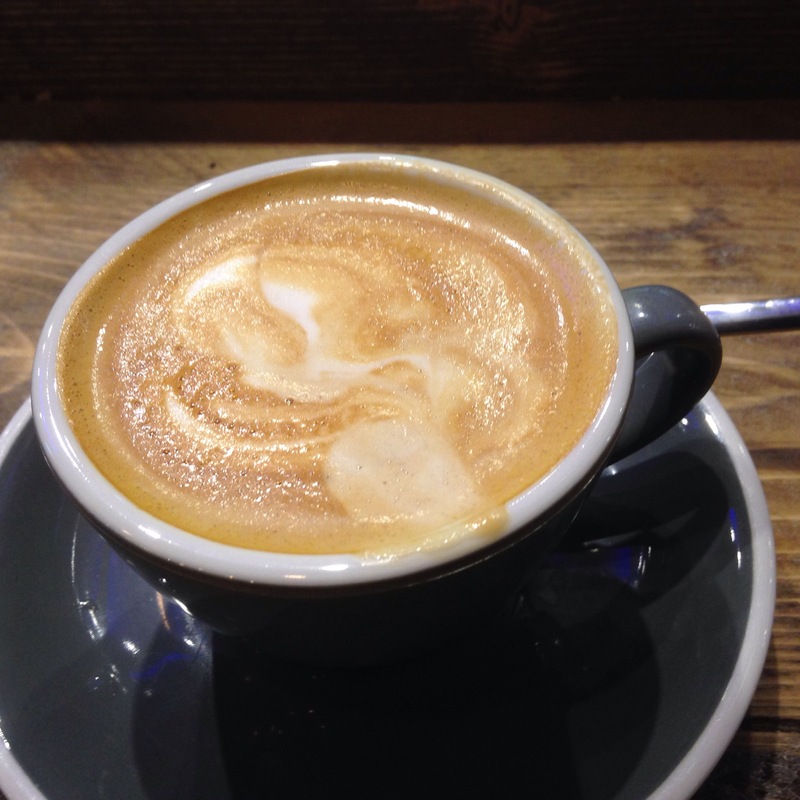 Over the next few weeks and months, York’s say that they are undertaking a transitional phase, in that they are stripping back their menu to provide the characteristics of a great coffee shop. A Smart food and coffee mix. 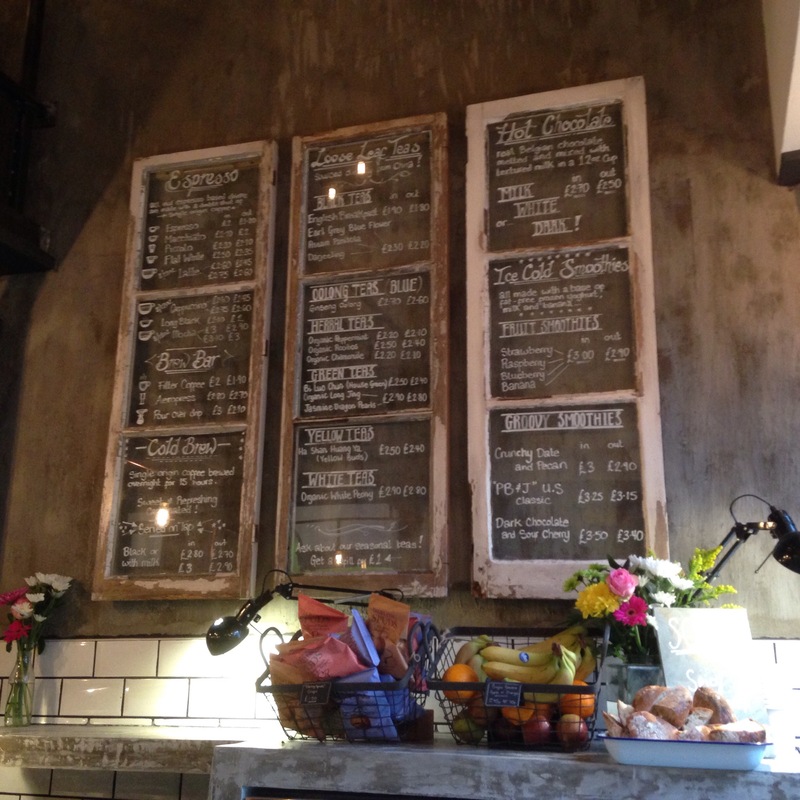 They provide a specials board of pancakes, sandwiches and hot breakfasts in the week and weekend. It also sells flour to make bread with. 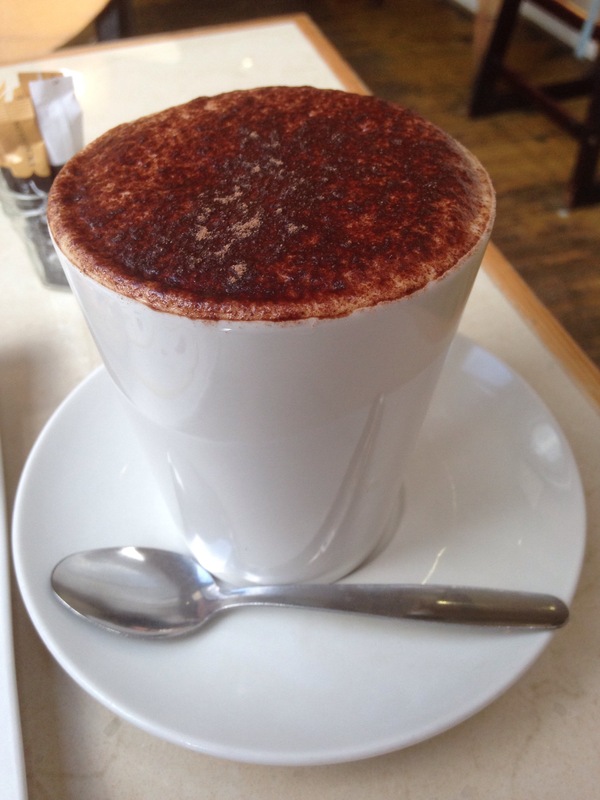 York’s Bakery and Cafe has a warm and relaxed atmosphere. It is a well recommended independent choice in the City Centre. 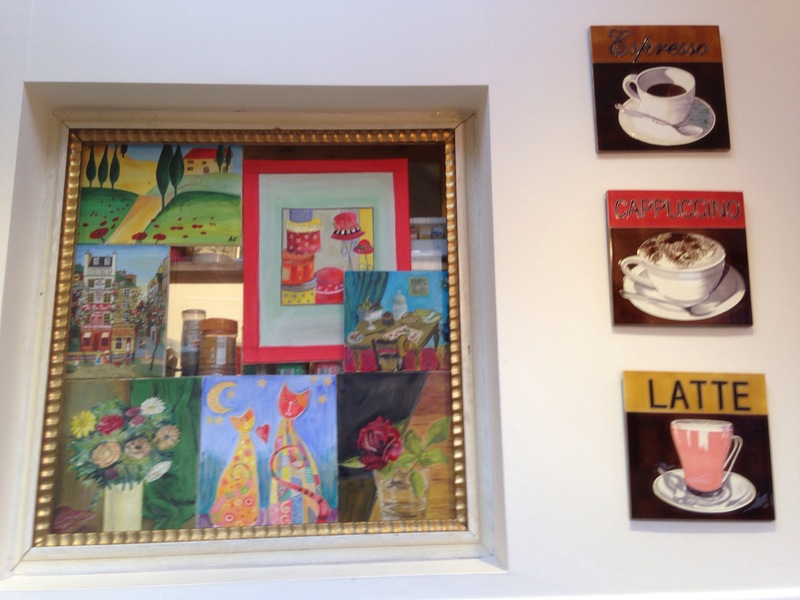 In fact it is a coffee shop to return to again and again, for the coffee and the cakes and food. 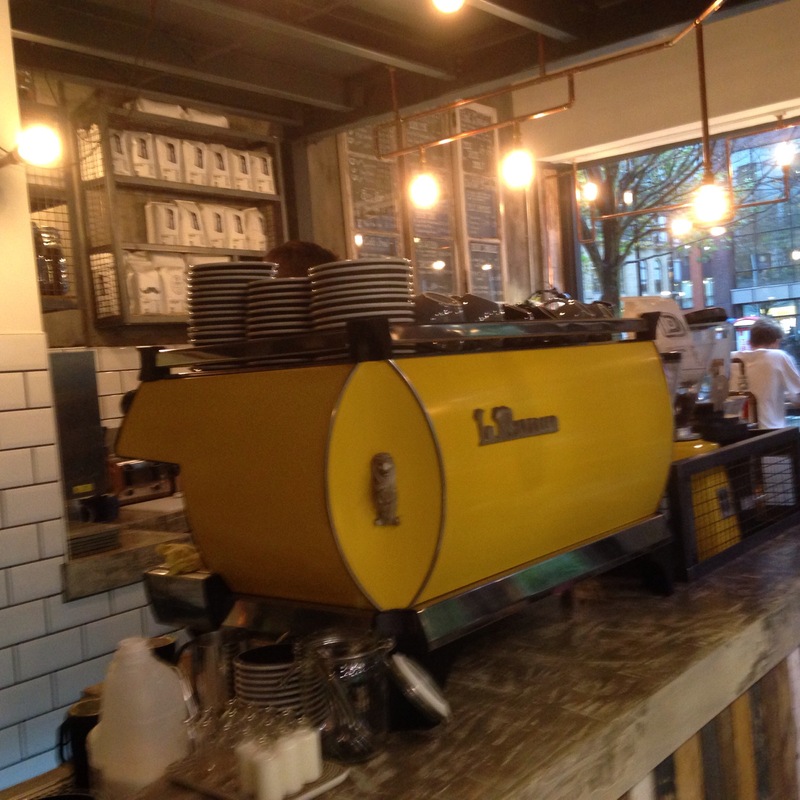 For details of the Independent Coffee scene in Birmingham see http://www.coffeebirmingham.co.uk and blog. 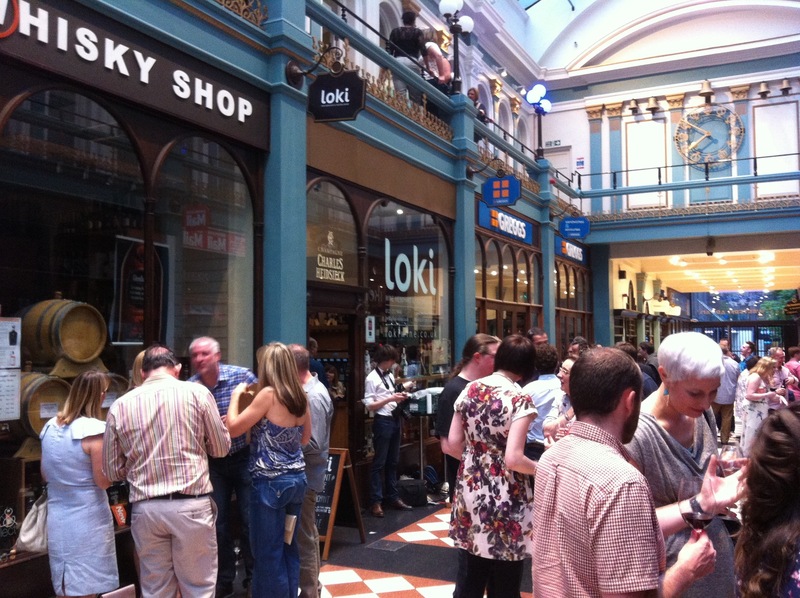 On the 14th June, Loki Wine Merchant and Tasting House held its 2nd Birthday party in the Great Western Arcade in Birmingham City Centre. 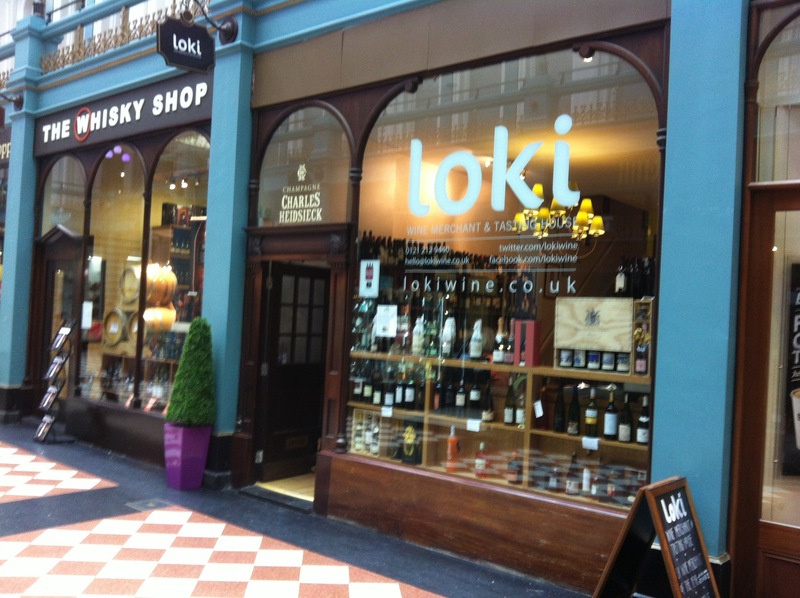 See my previous recent article on Loki wine. 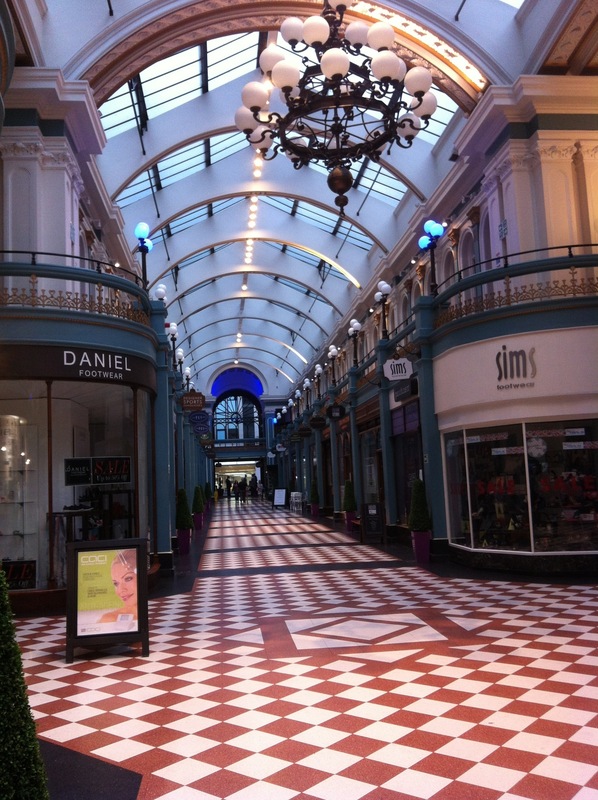 The Great Western Arcade where Loki are based is a beautiful arcade and on an evening when all the shoppers have gone home for the day it is even more picturesque and special. The arcade carried a different atmosphere that captured the Loki spirit of innovation and independence perfectly. On arrival Ruth and I were greeted with a glass of bubbly, which helped to soak up the relaxed party atmosphere perfectly whilst we waited in another Que for our food. I was really looking forward to the food. The food at the party was from esteemed pop up duo Clarke and Lee, (Peel and Stone) who have held food events (Soul Food Kitchen) at The Church in the Jewellery Quarter. Their food is a mixture of oriental and English fusion. On offer was a delicious veggie option and a meat option. My veggie option was lovely. 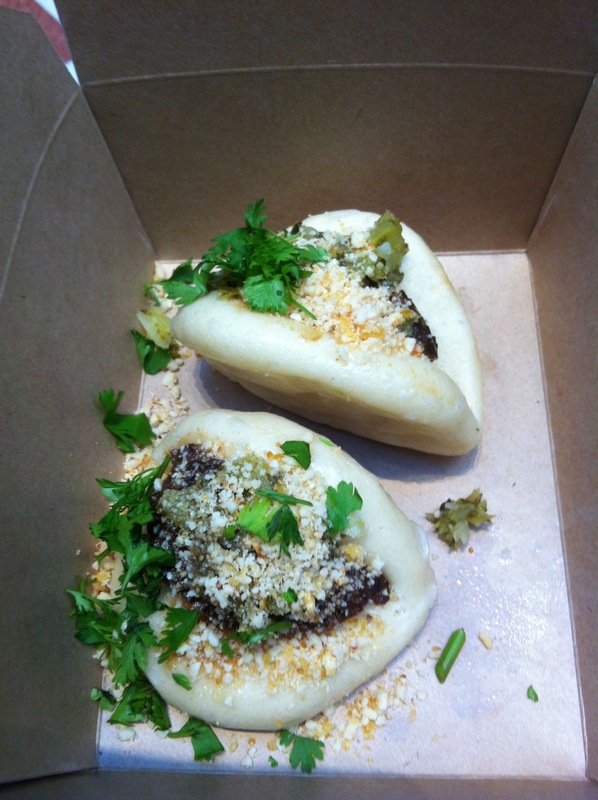 It was a mushroom dim sum type dish served in a steamed bun. 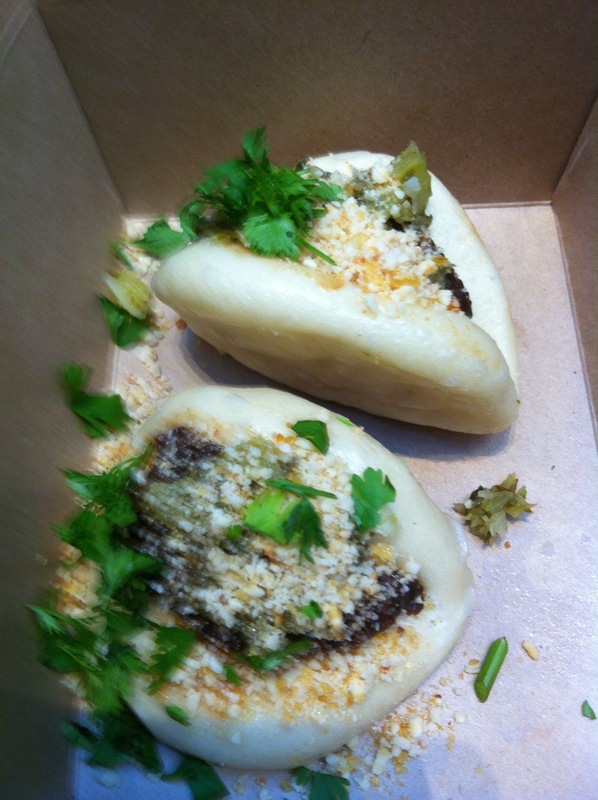 It was delicious, with a tantalising soy sauce and gentle spice flavour. The only shame was that there was not more on offer. It was served in a delightful cardboard box which was very sweet. Afterwards we ventured inside the shop and tasting room and ordered two glasses of Loki wines superbly crisp and sparkly Prosecco (see previous review of Bistro 1847) which we love. This we took upstairs to the relaxed bar seating area, which was busy and lovely. Throughout the atmosphere was superb, and lively with the cordial sound of people enjoying themselves with healthy chatter. We had a wonderful couple of hours. Loki Wine is a superb gem in Birmingham City Centre, unique and happening. 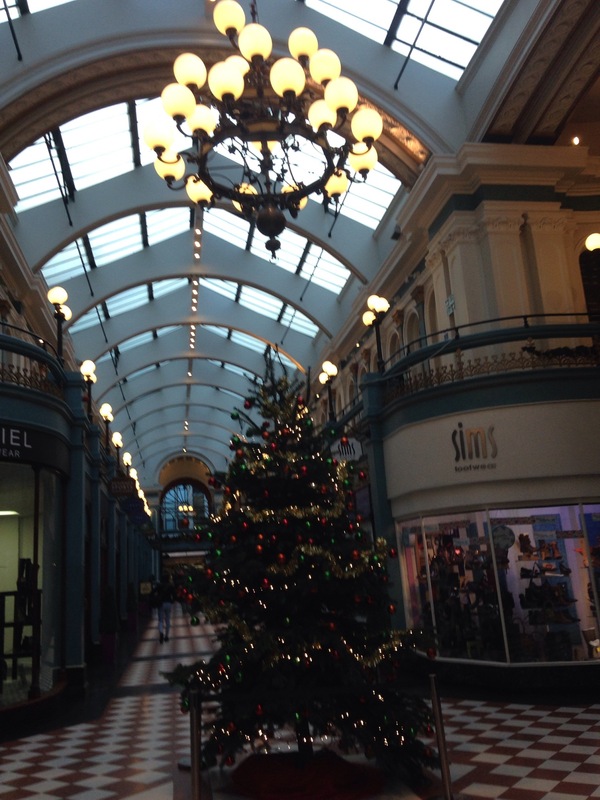 A real independent star in the Great Western Arcade. 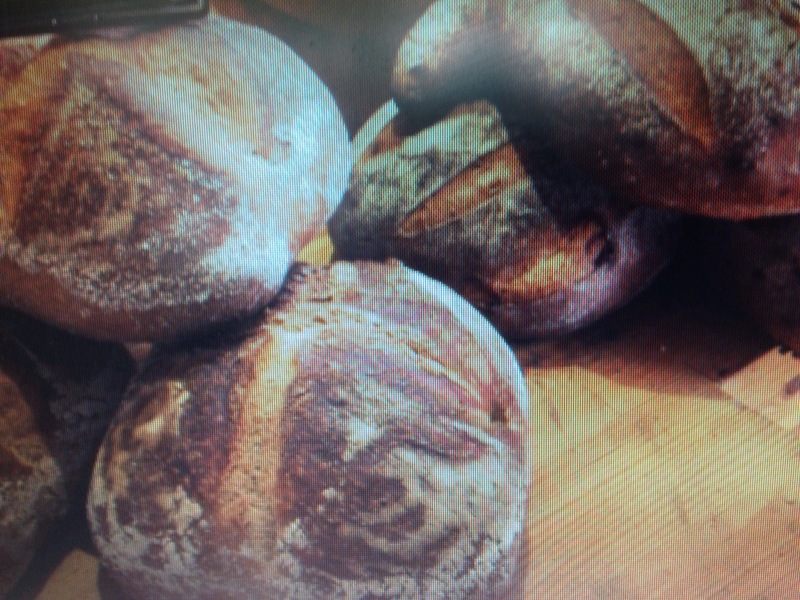 We also brought some superb bread from Peel and Stone in the Jewellery Quarter which was been sold at Loki’s party. See earlier blog article. Birmingham is thriving as a city of independent businesses. It is quite easy to believe the opposite looking around the Bull Ring and the high street. 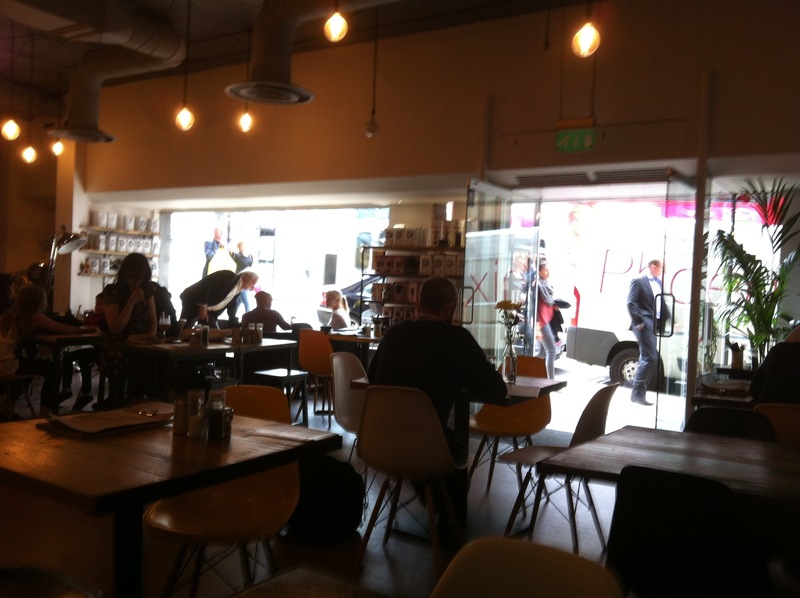 More and more independents, shops, cafe’s and restaurants are now thriving in and around the city centre. Independent Birmingham is the flag waving movement and website of all things independent in Birmingham. IB as it known is dedicated to unearthing the very best of Birmingham’s hidden gems and best kept secrets with the aim of encouraging people to re-discover the city we love. 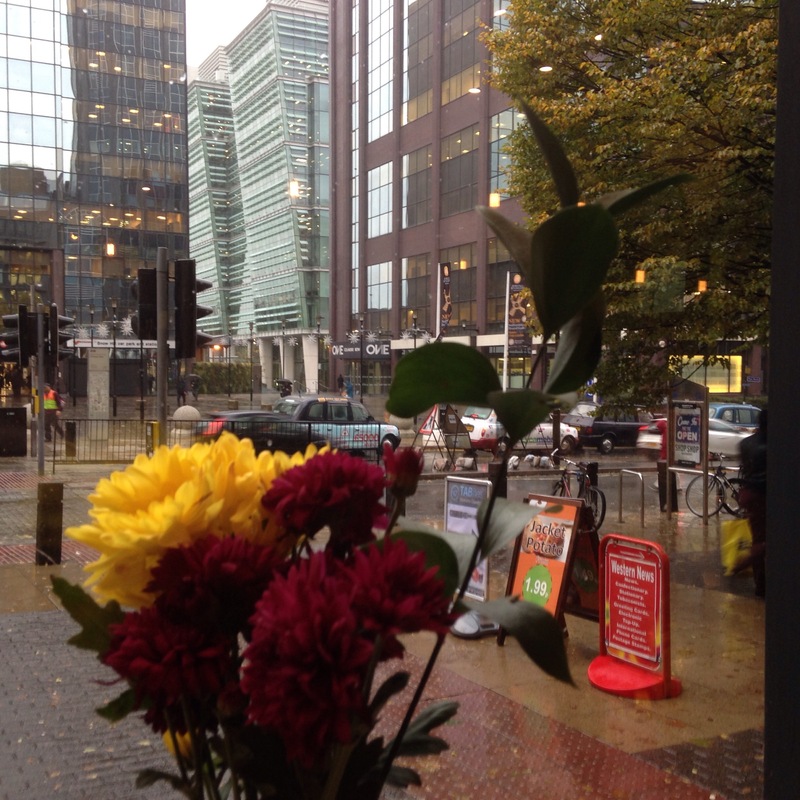 The ethos of supporting businesses with a local leaning and conscience is superb in my opinion, some of the best places to go in Birmingham City Centre and its neighbourhoods are independent and offer friendliness and a uniqueness that chains don’t provide. Independent Birmingham provide a year long membership card for £15 or two for £20. The card provides discounts and deals in signed up shops, bars and restaurants. It is a unique pass to a sunshine of localism and top quality places that provide an experience as well as uniqueness. Their website http://www.independent-Birmingham.co.uk provide a directory of all outlets signed up. Independent Birmingham announce new additions to the card frequently so keep an eye open for more. Recent additions are The Electric Cinema in the city centre who are offering IB card holders 2-4-1 tickets on standard seats form Sunday-Thursday, Rico Libre tapas in Digbeth who are offering 10% off breakfasts and tapas excluding Saturday evening, Itihaas Restaurant, 20% off Sunday-Thursday and The Coffee Lounge on Newhall Street 10% off and 20% off for afternoon tea for 2 people. They have recently announced places such as, Vintage Hideaway, Fletchers Bar and The Sun at the Station and Hare and Hounds in Kings Heath and the Dark Horse pub, Cafephillia, and The Java Lounge in Moseley. Plus Michelin starred restaurant Adams in the city centre, Ju Ju’s cafe by Brindley Place have joined along with the Jekyll and Hyde pub are offering 20% from Monday to Thursday off food. See website for full offers. Keep on eye on their twitter and Facebook accounts for further details, new additions and discounts. Stirling’s bar and lounge, Loki wine, The Victoria bar, The Bureau, Brewsmith’s coffee and tea, 6/8 Kaffe, Cherry Reds, Alfie Birds, Rose Villa Tavern, The Church inn in the Jewellery Quarter, Urban Coffee Shop, Home is where..cafe and deli, Island Bar, Twist, The Sun on The Hill in the city centre. Or you can sign up for the Independent Birmingham blog via their website and sign up for the card on the website too. Or at Twitter @andydhare or on the comments section below. Thanks for reading Veggie Foodie.